The good news, according to Malacañang spokesperson Gary Olivar, is that Noynoy Aquino will be taking over a “booming economy”. “It’s obviously a great note to end the President’s term with”, Olivar said. The country’s chief statistician agrees. “This is a glorious ending for the Arroyo administration and a good beginning for the incoming Aquino administration”, a jubilant Romulo Virola, head of National Statistical Coordination Board (NSCB), declared. 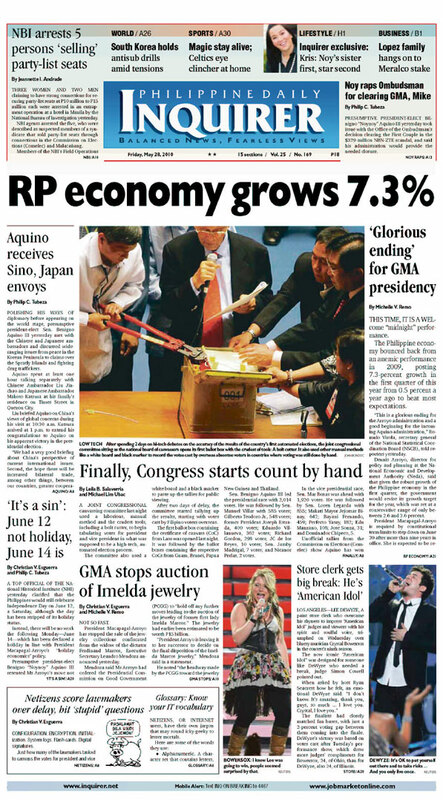 On Thursday (May 27), the NSCB reported that the country’s gross domestic product (GDP) grew by a robust 7.3 percent. The Philippine Daily Inquirer noted that it is “the strongest in almost three years and gave some relief to Arroyo who has been portrayed by critics as a corrupt ruler more focused on improving her family’s economic fortunes than the nation’s”. Mrs. Gloria Arroyo is buoyant, the Inquirer reported. This is classic Arroyo propaganda of a vibrant economy, a recurring theme used as a smoke screen for the corruption, plunder, sellout, political repression, and bad economic policies of the last nine years. But the growth is hollow and artificial; it does not in any way indicate a booming economy as Mrs. Gloria Arroyo’s spin doctors want to portray it. For one, the first quarter growth was mainly pushed by election-related spending and not by sustainable factors such as healthy productive sectors (i.e. agriculture actually declined by 2.8 percent, after stagnating in fourth quarter 2009). Elections create temporary jobs, give people instant extra money to spend, and make government to spend more. Consequently, personal consumption expenditure increased by 5.9 percent in the first quarter, outpacing its 3 percent performance in fourth quarter 2009. Government consumption expenditure, meanwhile, jumped by 18.5 percent, which the NSCB said is its highest ever recorded growth. Aside the elections, government spending was also pushed up by reconstruction and rehabilitation efforts after typhoons Ondoy and Pepeng hit the country late last year. Election-related expenditures may continue to make its presence felt in second quarter GDP figures with campaign spending in April making a last surge. After this are uncertainties. The financial turmoil in Europe is unfolding and the Philippines, with its small domestic market and deeply export-oriented manufacturing and agriculture is very much vulnerable. And while government hypes the 7.3 percent growth, left untold is that the economy is still reeling from the global financial and economic crunch. In fact, despite the seemingly spectacular first quarter numbers, the domestic economy is still in slowdown mode. While the GDP is forecast to grow 2.6-3.6 percent this year, up from 0.9 per cent in 2009, it is still below the 3.8 percent in 2008 and 7.1 per cent in 2007. These estimates do not yet factor in the very likely contagion of the raging crisis in Europe. At the end of the day, however, the GDP growth needs to mean something tangible and beneficial for ordinary Filipinos. You can read my previous posts, but let me also quote Mrs. Arroyo’s erstwhile favorite economic adviser: “My biggest frustration as a presidential adviser is that 34 quarters of uninterrupted expansion in the past nine years did little to reduce poverty and the number of poor people”, reelected Albay Governor Joey Salceda said in an interview with the Inquirer last March. Citing statistics on poverty, hunger, and skewed wealth distribution, Salceda, who is now with Aquino’s Liberal Party (LP), echoed what critics – citing the same statistics – have been saying all along, “The rich got richer, the poor got poorer” under Gloria. Now, the crucial question is can Noynoy – perhaps with Salceda again as among his economic advisers – correct this? Sadly, despite all the rhetoric about change and justice, prospects of far-reaching reforms in economic policies and strategies under Noynoy are dim. The problem is for Noynoy Aquino, Filipinos are jobless not because globalization destroys our local industries and people are poor because farmers and farm workers such as those in Hacienda Luisita are landless and duped by schemes such as stock distribution option (SDO). At first, I thought “kung walang corrupt, walang mahirap” was just a clever PR campaign to sell Noynoy as the complete opposite of Gloria and his fiercest presidential rival Senator Manny Villar. But looking at the people who designed his political and economic program, “kung walang corrupt, walang mahirap” is apparently more than a PR campaign but an expression of the so-called post-Washington Consensus ideology. Basically, this is an attempt by the neoliberals to justify the IMF-World Bank’s Washington Consensus (liberalization, deregulation, privatization, fiscal and tax reforms, budget cuts for social services, etc) by blaming corrupt Third World governments for the failure of globalization to bring about development and social justice. The emerging line-up of Aquino’s Cabinet including his likely team of economic managers and advisers indicates that no qualitative change in policies and general direction is in the offing under the new administration. Aquino, in the first place, did not promise major economic reforms that will deviate from the path taken by his predecessors. In fact, some analysts point out that the main theme of his presidential campaign – “kung walang corrupt, walang mahirap” (without corrupt officials, there are no poor) – exposes the lack of intention of Aquino and his team to reconsider current policies that have impoverished the people. By erroneously narrowing the poverty discourse to governance, Aquino has greatly limited the room for fundamental, pro-people economic reforms to take place. To illustrate, the team of economists that drafted his economic agenda and backed his presidential bid includes the most ardent champions of neoliberalism in the country, a discredited economic dogma implemented since the 1980s. They include the faculty members of the University of the Philippines School of Economics (UPSE) who pushed for bitter fiscal reforms that the Arroyo administration implemented including VAT reforms and reduced budget for social services, among others. These are also the same economists who justified wage freeze, automatic debt servicing, privatization, deregulation, liberalization, and other neoliberal reforms that have worsened unemployment and poverty in the country.